Hals' picture, now in the Louvre, is usually dated to the early 1620s. Another copy by Bailly after the same composition is in the Rijksmuseum, Pieter Biesboer and Martin Bijl, Frans Hals, exhib. cat., London, Royal Academy, 1989, p. 170, under no. 14, fig. 14d. That copy, dated 1626, offered a terminus ante quem for the dating of the picture until the appearance of the present sheet dated 1624, which its date of executions to be brought back by a further two years. It is generally accepted that Bailly did not work from the original by Frans Hals but after an early copy which, until the Louvre picture was acquired in 1984, was far more famous. David Bailly re-used Frans Hals' composition as a trompe l'oeil print in his large Vanitas now in Leiden. 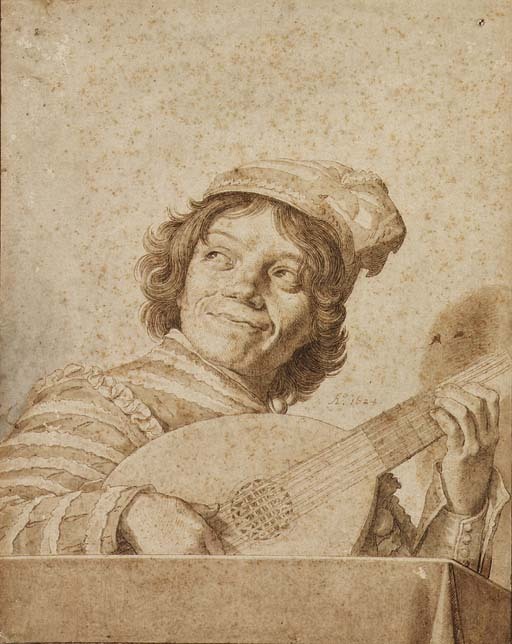 Another drawing by Bailly after Frans Hals' The Rommel Pot Player, also dated 1624, has served to date Hals' composition.